Rockmilk Cave is a medium-sized cave between Bravil and Leyawiin containing marauders and bandits (quest-related). 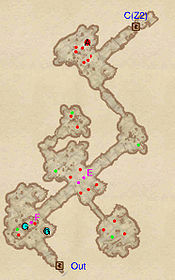 It contains two main zones: Rockmilk Cave and Rockmilk Haven. 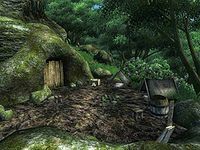 Technically, the tent in Rockmilk Haven is a third zone, named Rockmilk - Blackbow Camp, but in this article the tent's contents have been included in Rockmilk Haven. This cave contains 13 Cairn Bolete plants and 14 Wisp Stalk plants. The occupants of the caves are both Marauders and Black Bow Bandits, who hate each other and will fight each other to the death. All of the Black Bow Bandits carry Black Bows which can be sold to Count Marius Caro for 100 gold each, provided that you have completed the Knights of the White Stallion quest. When you enter the cave on a day Mazoga is there, she will spawn in the second room, right in between some Bandits and Marauders. In the construction set, there are four zones associated with Rockmilk Cave. However, the zone RockmilkCave02 is not accessible in-game. 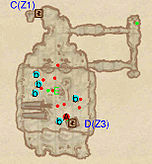 This issue has been addressed by version 3.1.0 of the Unofficial Oblivion Patch; some of the changes include tidying up and renaming the missing cell and connecting it with the rest of the dungeon. 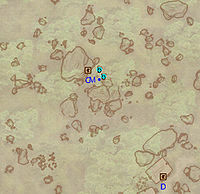 This location's map marker (M on map) is named Rockmilk Cave (editor name RockmilkCaveMapMarker). The entrance door is NW of the marker, 20 feet away. You enter this zone at the entrance (Out) and connect to the second part of Rockmilk Cave through door C. The main obstacle getting through the cave is the unusually large number of enemies, although (as mentioned in the notes) the enemies will tend to spend their time fighting each other. There are also a couple of traps. 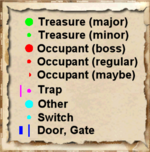 1 Cave In trap at location F on map, triggered by approaching the trap. 2 Swinging Mace traps at E, both triggered at the same time as you enter the cavern. You enter this zone through door C; door D is simply the entrance to the tent. Be sure to enter the tent, because the boss-level chest is within. All ten of the NPCs in this area are involved in a single large melee. Therefore, it is possible to strike a single finishing blow, and as a reward loot ten corpses and multiple chests. Your biggest challenge is likely to be just figuring how to carry all the loot out of the cave. Dog named Pumpkin (the Black Bow Bandit boss' dog; non-respawning; found inside the boss' tent). Pumpkin will generally not attack the player.